Turkey is the meeting point of two continents where you can indulge in the best of Asian and European lifestyle, culture and food! If you book one of the cheap holidays to the capital city of Istanbul that are regularly available throughout the year, make sure you take a look at this guide to help you keep within a low budget. 1. Foodies can immerse themselves into the sights, sounds, smells and tastes of one of the oldest spice markets in the world, Istanbul’s Spice Bazaar. Peruse the myriad spices, herbs, nuts, vegetables and dried fruits. There are also herbal remedy stalls for the mind, body and soul. 2. It’s not a holiday without a visit to the beach, so head to Turkey’s shores for Mediterranean sun and beautiful waters. Reputable resorts include Alanya, Kalkan, Kaş, Fethiye, Çıralı and Patara. You can even spot turtles on Iztuzu beach! These resorts offer plenty of water sports, diving excursions, beach sports like volleyball and cafes for refreshment. 3. A lot of Istanbul’s museums and galleries are free of charge to enter and they are a great way of learning more about the surrounding culture. The Istanbul Modern is the city’s first modern art museum, Museum of Painting and Sculpture exhibits fine art from the 19th and 20th-century and the Santralistanbul culture complex has an Energy Play Zone! 4. 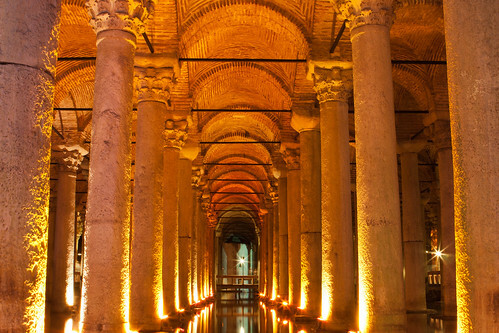 Dare yourself to visit the largest of Istanbul’s ancient underground cisterns, the Basilica Cistern in Sultanahmet Square. Entering the columns that are decorated with Medusa heads, you will be transported back to the 6th-century during Byzantine Emperor Justinian I’s reign. James Bond fans might recognize this from the 1963 film From Russia With Love. 5. If you visit during April, witness the three million colorful tulips that bloom across the parks and gardens of the city. This is to celebrate the International Istanbul Tulip Festival. This particular flower is representative of Turkey’s history because the reign of Sultan Ahmed III was also known as the “Tulip Era”. A free festival of music, art exhibitions and live performances also takes place in Emirgan Park. Along the way you should also fill up on culinary treats that are influenced by Aegean and Mediterranean diets — you must try a kebab and some Turkish delight! There are plenty of free things to do in Istanbul, so all you need to do is get there. Images by Moyan Brenn and Brian Jeffery Beggerly used under the Creative Commons License.